This book is written for you; whether you already operate your own small business or intend to start one. It covers the complete planning process. First, you will need to consider some of the factors involved in preparing your operational plan. Then learn some of the elements that go into preparing your marketing plan and how to go about writing an effective advertising plan. The Internet plays such an important role in modern business that you are advised to examine its effects on your business and some of the challenges you may face with your existing customer base if you use disintermediation to cut out wholesalers or distributors and sell direct to your end-users. Employee wages can be a significant business expense; especially if you intend to operate in the service sector. Take a look at some of the alternatives such as sub-contracting, automation or computerization to minimize your staffing requirements. You are cautioned to pay attention to some of the legal issues regarding third-party liabilities, honesty bonds, intellectual property and non-competition agreements. Find out how to motivate your workers through Employee Share Ownership Plans and performance bonuses. Set your strategic objectives and avoid the error of setting too many goals. Then, calculate how much money you will need to achieve your objectives. Learn how to bring everything together to create your business plan. Take a look at how you would prepare your plan differently if you operate in the manufacturing sector or the service sector, the retail or construction business. Take a look at software you can use to prepare your plan and some of the factors you should consider before printing your plan. Then, learn how to use your plan as a financing document and how to make effective presentations to potential investors or lenders. Finally, consider your plan as a dynamic document that can be modified as circumstances change. 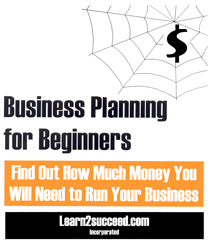 Business Planning for Beginners: Where to Find Money to Grow Your Dream by: Learn2succeed.com Incorporated: softcover; 150 pages; ISBN: 978-1-55270-356-4; published in 2009; Canadian: $24.95.